Non-Personalized Baselines that give unsophisticated, rule-based recommendation. Collaborative Filtering on either explicit or implicit user-item matrix. Evaluation based on a variety of rating and ranking metrics, with easy-to-use $N$-fold cross validation executor. Additionally, the package is highly extensible because data accessor, model, and recommendation module are fully separated and independent in the implementation. 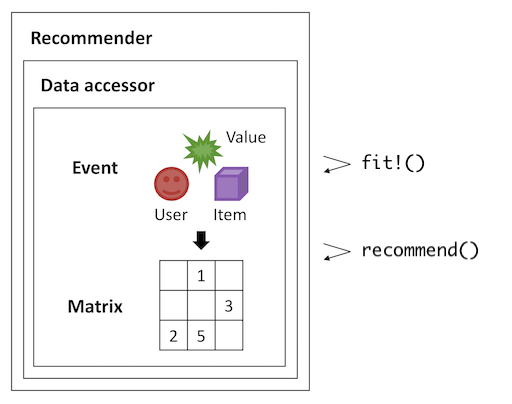 That is, you can develop and test your custom recommendation logic at ease.